Do you ever feel like your dog is a copycat? A new study shows that dogs can imitate human behavior for up to ten minutes after it has happened. Prior to this study, only apes and humans had been shown to demonstrate this ability, one that requires a high degree of cognition. The researchers were testing a concept previously applied to chimpanzees--a training concept called "do as I do." The dog must be able to pay attention to what the human is demonstrating, and also to imitate what they've seen, sometimes minutes after they have seen the act performed. The researchers even blocked the dog's view of the test objects after they initially watched them being used. 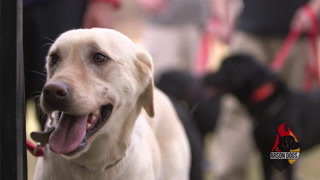 They worked with dogs of varying breeds and ages, testing each dog's ability to copy his or her owner's behavior. Almost all of the dogs had close to perfect scores. This study is the first to show that dogs are capable of this concept of "deferred imitation." This suggests that dogs also have long-term memory about facts and events that can be consciously recalled, an ability that has previously only been proven in humans. We now know that dogs have an uncanny ability to imitate our actions, and that they are hard-wired to learn from us. What better reason is there to justify using only positive training methods when teaching these incredibly intelligent animals? Dogs have evolved to learn from watching and mimicking our behavior, as this has proven to be beneficial for their safety and survival. This study is incredibly informative about our dogs' cognitive abilities, and serves as a reminder of why it is so important that we treat them with respect and without a heavy hand. Can Wolves Learn From People? Can Your Puppy Follow Your Voice to Food? How Does Your Dog's Attention Change Over Time?